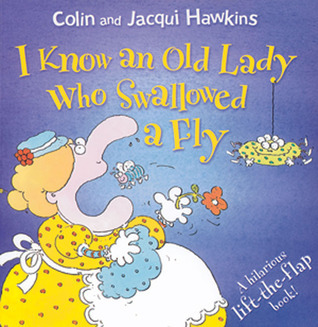 Home hawkins Colin Hawkins Jacqui patch the old lady who swallowed a fly Throwback Thursday Throwback Thursday: The Old Lady Who Swallowed a Fly! From the Author: I know an old lady who swallowed a fly. I don't know why she swallowed the fly—so read along and find out! Meet all the animals that end up in the old lady's tummy—but what will happen when she starts to get a bit full? This is a comical retelling of the favorite nursery rhyme from a popular team, with lift-the-flap pages that are just right for small hands. This book was a major part of my childhood. Every time I think about it, I am instantly taken back to kindergarten. I remember my teacher reading it to me (Shoutout to Mrs. Osburn, one of my favorite teahers ever! ), and I remember laughing so hard at it. I would always beg her to read it to us. Finally she just ended up letting me keep it at my desk so I could read it. This book takes me back to an amazing point in my childhood. Everyone should read this! !